Everyday people from all over the world register hashtags with Twubs. Registration provides you with a record of your claim that can be used in any trademark or other legal challenge. We record the date of registration and the important details regarding the registrant. Protect your future, register today. No SEO strategy is complete without Twubs hashtag registration. Twubs free registration exposes the primary information about your hashtag in a format optimized for search engines. 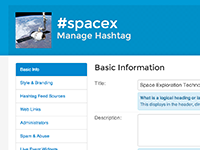 Branded hashtag pages are the missing link for any hashtag marketing strategy. They are the perfect place to send your audience! Great for Conferences, Twitter Chats, Small Groups and more. You are in control. Twubs features a fully customizable feed. You have the power to block users and words and delete posts from the feed. Hashtags are a great way to organize your followers and get the word out about your brand. With Twubs, they are even better because we give you a great place to send your audience. Registering your hashtag gives you access to everything mentioned above, plus by putting it in our directory we make it easier for people to find you and your hashtag. Please select at least one tag or create your own. Please enter a title for your hashtag. Please enter a valid contact email for your hashtag. Please enter a valid contact phone for your hashtag. Please select at least one day. Please enter the date that this event will occur on. Please enter a start time. Please enter an end time. Link to Twitter account ? You are about to register this hashtag as . An email will be sent to with detailed instructions on how to get started and get the most out of Twubs! You are about to register this hashtag as . An email will be sent to the above email address with detailed instructions on how to get started and get the most out of Twubs! Woah! That's a lot of Hashtags! You have exceeded the limit of free hashtag registrations. Please sign up for any of our subscriptions to gain access to a lot more registrations. You have exceeded the maximum limit of hashtag registrations. Please contact us to extend the limit or unregister any unused hashtags to free up registrations. Now That You're Registered, Get Verified! You invest a lot of time and money in your brand. Twubs' Hashtag Verification notifies the world that your brand or event is associated with this hashtag. In the tornado of social noise, a Twubs’ Verified Hashtag allows you to craft messaging around the context of your hashtag. It also provides the assurance of third-party validation that you are who you say you are. Associate keywords and additional content with your hashtag on your promoted search engine indexed page. Verification is a valuable and strategic tool in your marketing arsenal. Once verified, Twubs will provide you with a "Certificate of Hashtag Inception". You also secure management of your hashtag and brand on Twubs. Outside of Twubs, we are working hard to establish industry best practices for the use of brand-based hashtags. Twubs cares about your substantial investment in your brand. 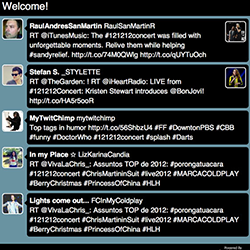 Twubs is the keeper of record for the IP assets related to your hashtag, in a single location. This ensures people know the power and presence of your brand. 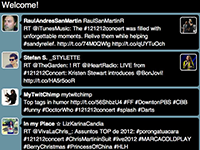 Twubs curates one of the most comprehensive hashtag directories on the internet. 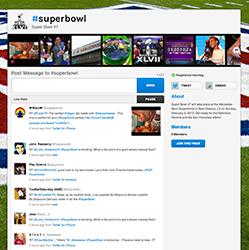 Your verified hashtag gets top-level placement within our directory. Twubs "Verified" badge will be placed throughout Twubs where your hashtag displays. 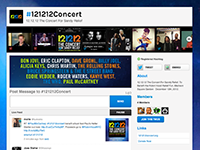 You may also add the badge to your other web properties and marketing. Hashtags have evolved. You invest a LOT of time, money, and heart in your brand, marketing campaigns, and social engagement. Twubs’ Hashtag Verification is the now and future of the power of hashtags in the modern connected world. Which Hashtags Can I Verify? Hashtags related to your brands, marketing campaigns, products, social identities, websites, Twitter chats, trademarks, slogans, etc. Which Hashtags Can NOT be Verified? General words like #phone, #technology, #cats, #monkeys. Other people’s stuff! C’mon, you know that ain’t cool. Social Media users want to know what your hashtag is about and who is behind it. They want to have confidence when using your hashtag. A Twubs Verified hashtag is one that can be relied on. Twubs provides additional Search Engine Optimization features for Twubs' Verified Hashtags. No SEO strategy is complete without verification. Make sure the data you provide us is thorough and accurate so that we can provide the best SEO for you possible. Once verified, Twubs will provide you with a "Certificate of Hashtag Inception". Further, Twubs will provide you the ability to permanently secure management of your hashtag and the brand associated with it. Outside of Twubs, we are working hard to establish industry best practices for the use of brand-based hashtags. Your intellectual property is our top priority. Twubs is the keeper of record for associating your IP assets with your hashtag. When people search for your tag on search engines, we provide a single location associating your trademarks with your hashtag. 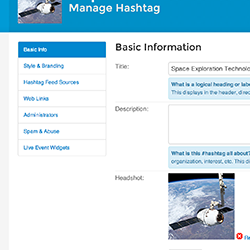 The Twubs hashtag directory provides an easy way for social media users to find your hashtag; but, more importantly, it also enhances Search Engine Optimization. When you verify your hashtag, you get top-level placement within our directory for as long as you remain certified. When you verify your hashtag, the Twubs "Verified" logo will be placed throughout Twubs in association with your hashtag. Further, you have the ability to use that logo in placement outside of Twubs. We schedule a PHONE call. We research the details of your verification submission. Emblazon the swanky badge on your Twub. Promote your hashtag in the Twubs directory. Much more coming soon... We're just getting started.